New Homes – Can a new homeowner even plan to “go green” and keep a yard healthy when they landscape it or is it too much? Sadly a house is more than just the TV, some furniture and a place to plugin your cell phone. In my opinion you may as well have a condo if you really don’t want the yard. Existing Homes – Rehabilitate the yard, no concentrated fertilizers or pesticides and use locally produced organic compost or more natural chemicals. The argument that they both achieve the same results with similar chemical means is understood but that’s why you read the label. Also being prepared that sometimes seeing smaller yields from our gardens with a few bugs is totally acceptable. Drought – We are experimenting with drip irrigation and hope to install a rainwater collector to use for the some of our plants rather than using city water and of course this assumes we have rain this year. Sometimes the grass goes brown simply because it needs to be dormant. We use our small garden to supplement fresh vegetables and use containers for other plants that need more care. Trees – It’s always a hard call but maybe for us trees are more about aesthetics and sound than to cool and again stop erosion. Our house is very close to the street so a tree in our front yard is necessary. Unfortunately the tree that came with the house is a river birch which means water, water, water. The year before was particularly tough for it so we ended up having to top it due to die back. I’d take it out completely but it still has use and a new tree costs money. 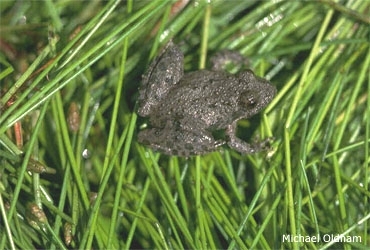 Being Green outdoors can be easy if you think it through for your needs although I’m afraid we may be too late for the tiny Blanchard’s Cricket frog here in Canada.